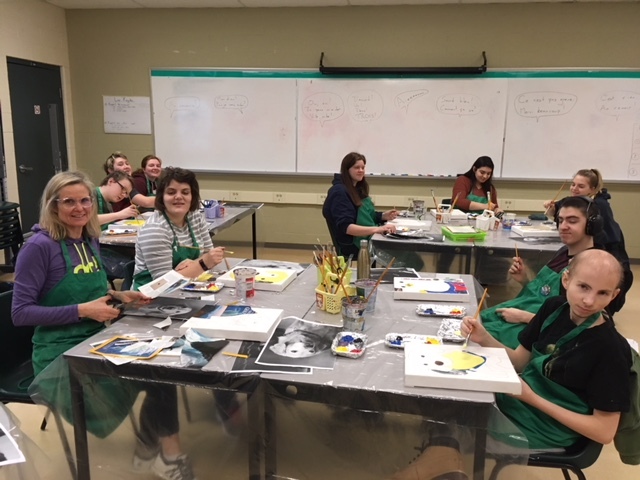 This winter, the MacLaren Art Centre in Barrie partnered with COPE Service Dogs to deliver a hands-on art workshop for students at Nantyr Shores Secondary School. Led by artist instructors from the MacLaren VanGo Access team, the workshop offered students in the Canines in the Classroom programme an opportunity to explore collage and a variety of painting techniques to create artwork inspired by the service dogs they work with. 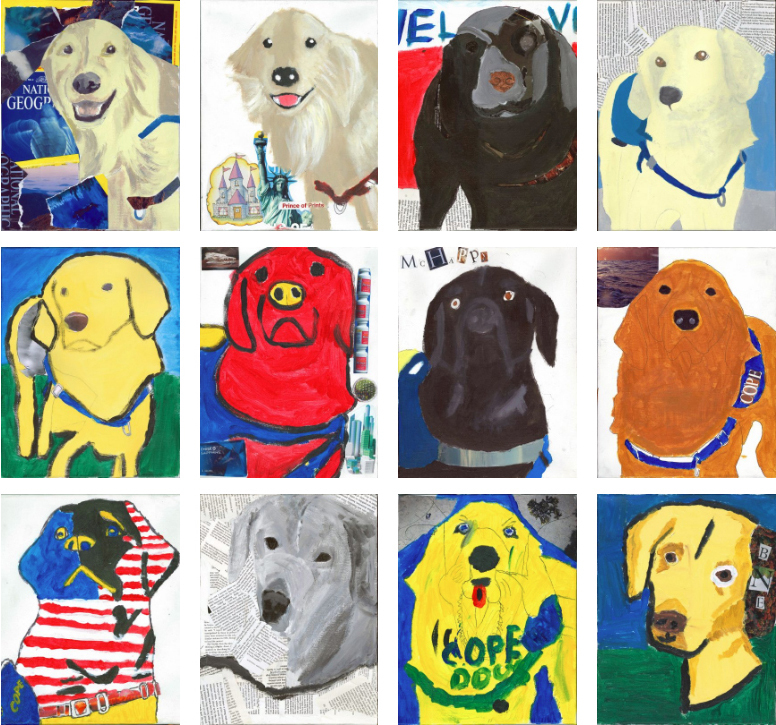 The outcomes from this VanGo Access workshop form Paw-fect Portraits, a community exhibition on view in the MacLaren’s Rotary Education Centre until March 31. COPE provides “Service Dogs” for people living with disabilities and “Facility Dogs” to help the therapeutic practices of organizations like Hospice Simcoe and the Child Advocacy Centre. Part of the dogs’ training takes place in Canines in the Classroom—a high school programme in which students facing challenges earn credits by learning to train the COPE dogs. This deep learning experience prepares students for work in the 21st century and positively impacts mental health. An important aspect of the training for both the students and the dogs is Reading Buddy, a programme in which the student/dog teams visit elementary schools so that children can build literacy skills by reading to a non-judgmental canine buddy. VanGo Access is an extension of VanGo, the MacLaren’s signature education programme in the schools. Through this outreach programme, practicing visual artists from the region lead hands-on visual arts workshops to community groups that would otherwise not have these opportunities. The MacLaren would like to give special thanks to Jane Boake who is the Founder of COPE Service Dogs and Canines in the Classroom, and also a Special Education Teacher at Nantyr Shores Secondary School. Appreciation is also extended to the youth who participated in this special project. MacLaren VanGo is generously supported by The Sarjeant Co Ltd., J. Stollar Construction Ltd., Honda Canada Foundation, Advanced Motion & Controls Ltd., Kempenfelt Rotary Club, Rotary Club of Barrie, Curry’s Artists’ Materials and the Kiwanis Club of Barrie. Our e-newsletter is a great way to receive a monthly summary of important information and current events. Subscribe to stay on top of everything that’s going on!